In my list of ‘famous Indians around the world’ Deepa Mehta takes a special place. 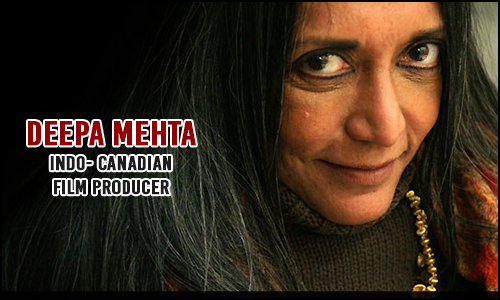 Born on 1 January, 1950 in Amritsar studied in New Delhi graduated in India Deepa Mehta now lives in Canada. Numerous documentary makers across the globe take inspiration from here work and try to produce her quality level of work. She is a screen writer, director, and producer of many lush and emotionally resonating movies. Her work has been called courageous, proactive and breathtaking by critics and directors across the world. Her movies are a must in many of the international film festivals. She has received numerous awards and accolades which have been distributed across the world. Her first feature film ‘Sam and me’ won a special award from jury and got her the recognition. She is much more famous for her unique trilogy – Fire, Earth and Water. She was recognized by Canada Film Festival with her first movie in trilogy; fire. It is still the top ten grossing movies in Canada. It crossed over the box office success in Toronto International Film Festival. Due to a major mishap in India in 2000 she directed her last trilogy ‘Water’ in Sri Lanka. This movie got her the nomination for ‘Best Foreign Film’ for the 79th Academy awards. It is still the most favorite movie among the viewers around the world. This movie got screened in every film festival around the world and brought Deepa Mehta immense happiness and recognition for her work. Disruption in homeland made her turn to Canada and decided to keep her culture alive and prosper more as a Canadian. Deepa Mehta is one of those Indian immigrants who have got recognition and a chance to make people proud by taking the opportunity in other countries rather than in their motherland. This women made the nation proud on the top listing, still her movies evergreen and inspiration for the newbie filmmakers.Not only the Canada whole world should be proud this brave Indian women.